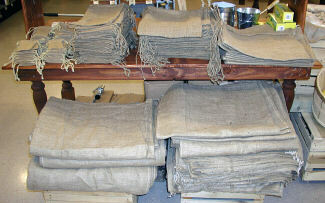 Earth friendly, natural burlap sacks in several different sizes. Use them for storage of goods and produce or as an alternative to paper or plastic shopping bags. Outdoors or on the farm they make ideal covering for delicate plants and flowers, and filled they make good sandbags or compost bags. Artists also often find them useful as a base for their projects. Please note: The 3X5", 5X6", 6X10" & 8X12" sacks have drawstrings.